Chris Cleave asks more of us. 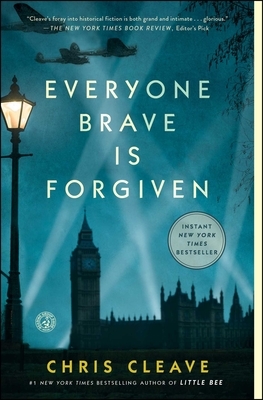 Everyone Brave is Forgiven is a novel inspired by his grandparents' history in WWII. It is a familiar story, but entirely unique. It was the greatest generation, undeniably heroic. But to deny their daily struggles, and their sins small and large, is to dehumanize them, to distance them from our own potential for greatness. The racism he portrays is atrocious. War exacerbates our tendencies. It pares our priorities to primary needs: food, safety, human connection. We must be brave in peacetime as well. We must remember the lessons of war, of what we should be fighting for, and honor its sacrifices. Think of what we are capable. Cleave's writing is smart and beautiful, but never overwrought. In an author's note, he uses a metaphor for writing the novel, one story in a giant war. Like the soldiers he portrays digging in the shallow dirt at Malta to plant seeds, he can just dig a small hole. I'd extend the metaphor to say that not only did his seeds take root, but that he hit bedrock, and his tale echoes with the widening resonance of its greater truths. At some point, one would think that every possible story, angle, battle, relationship that arose from WW2 has been told. What more could there be? The sad truth is that as long as there is the possibility of going to war again, we need to remember what happened in previous wars – the loss, the pain, the privations, the toll paid by individuals and nations. Chris Cleave beautifully reminds us and indeed teaches us about engaging characters and heart-wrenching situations. Everyone Brave is Forgiven follows young, eager and privileged Mary, anxious to do her part as soon as Britain declares war. Tom and Alistair are flatmates; one enlists and the other continues to work in London and they both love Mary. Though she sees herself as a spy or as an attache to a general, Mary finds herself teaching school. Her commitment and bravery in London during the Blitz are matched by that of the soldiers stationed on Malta. The letters that pass between the two fronts both illuminate and obfuscate the reality of both situations. The story moves quickly and the dialogue is reminiscent of Evelyn Waugh and Oscar Wilde – brisk, smart, world-weary, and totally entrancing. London, 1939. The day war is declared, Mary North leaves finishing school unfinished, goes straight to the War Office, and signs up. Tom Shaw decides to ignore the war—until he learns his roommate Alistair Heath has unexpectedly enlisted. Then the conflict can no longer be avoided. Young, bright, and brave, Mary is certain she’d be a marvelous spy. When she is—bewilderingly—made a teacher, she finds herself defying prejudice to protect the children her country would rather forget. Tom, meanwhile, finds that he will do anything for Mary.